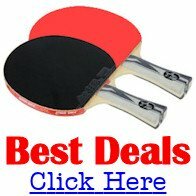 Where are the next World Table Tennis Championships being held? The premier competition for professional table tennis players is the World Table Tennis Championship. Alongside the Olympic Games, the World Championship is where every table tennis player wants to be ... and perform at their best in order to claim the title of World Champion. So where are the next World TT Championships being held? Well, since 2000, the World Table Tennis Championship has been split into two separate competitions. So the next World Championship individual events will be held in Budapest, Hungary from 21-28 April 2019, whilst the next team event will be held in Busan, South Korea in 2020. So who are the current World Champions? 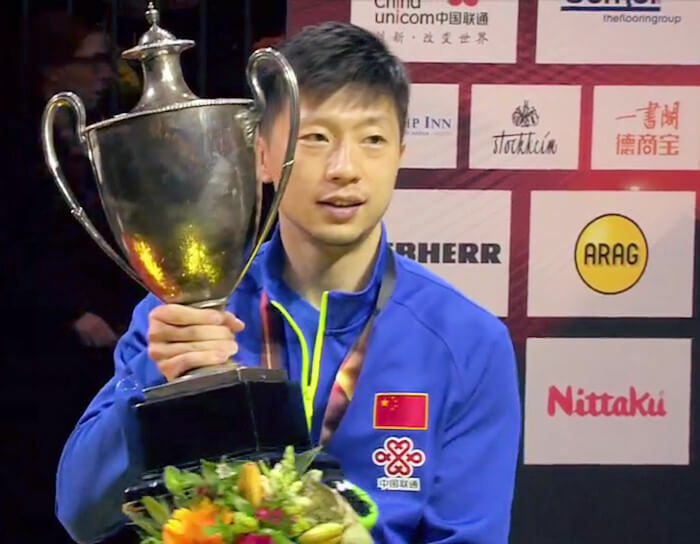 Ma Long of China is the current holder of the individual men's title following his victory in Dusseldorf, Germany in June 2017 when he beat Fan Zhendong (China) to retain his men's singles crown (the St Bride Vase). He will hold the title until the next individual events take place in Budapest, Hungary from 21-28 April 2019. 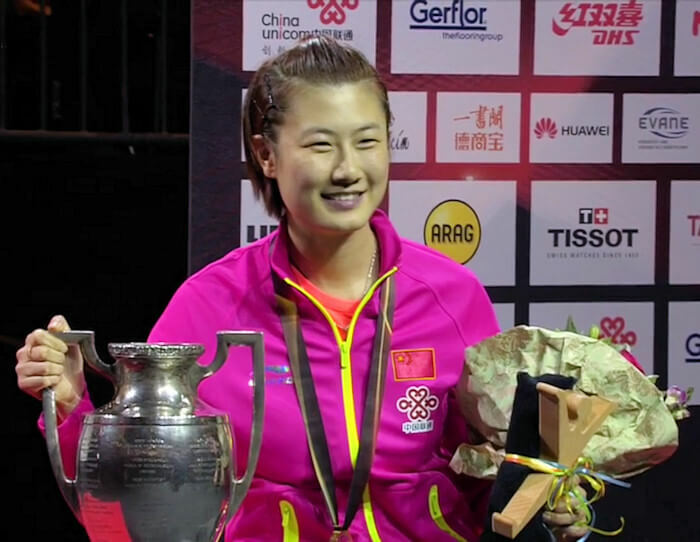 In the 2017 women's singles event, Ding Ning of China retained her title of World Champion and The Geist Prize when she beat Zhu Yuling (China). Ding Ning will hold the title until the next individual events take place in Budapest, Hungary from 21-28 April 2019. 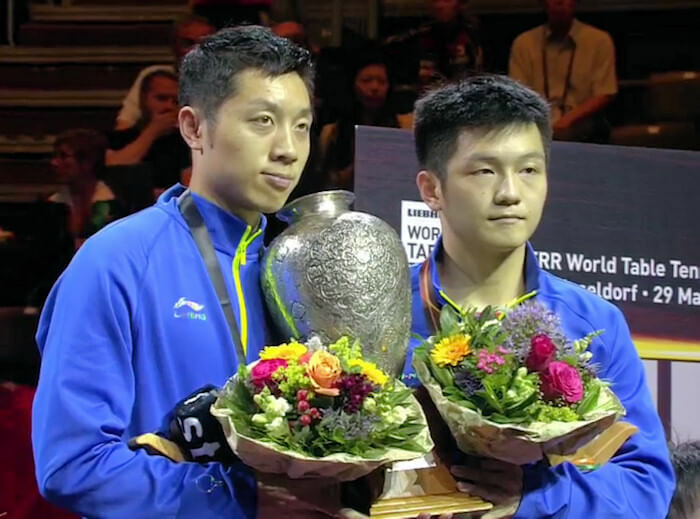 In the 2017 men's doubles event, it was Xu Xin and Fan Zhendong of China who took the title of World Champions when they beat Masataka Morizono and Yuya Oshima of Japan to win The Iran Cup. Xu Xin and Fan Zhendong will hold the title until the next individual events take place in Budapest, Hungary from 21-28 April 2019. 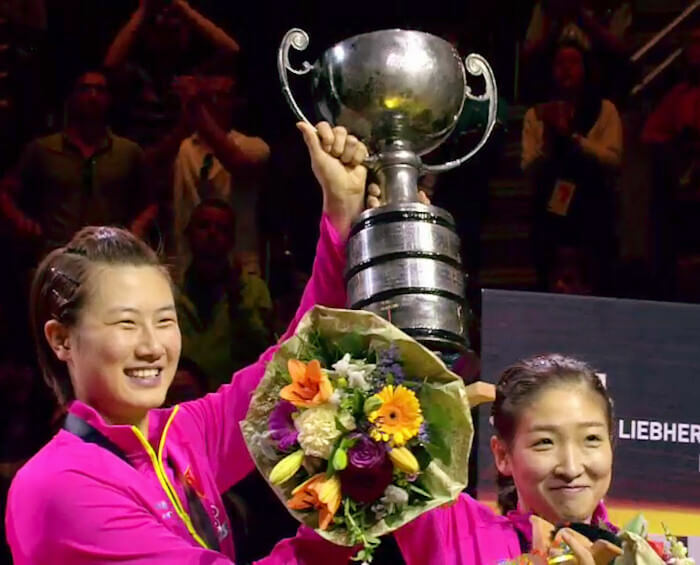 In the 2017 women's doubles event, it was Ding Ning and Liu Shiwen of China who took the title of World Champions when they beat compatriots Zhu Yuling and Chen Meng to win The W.J.Pope Trophy. Ding Ning and Liu Shiwen will hold the title until the next individual events take place in Budapest, Hungary from 21-28 April 2019. 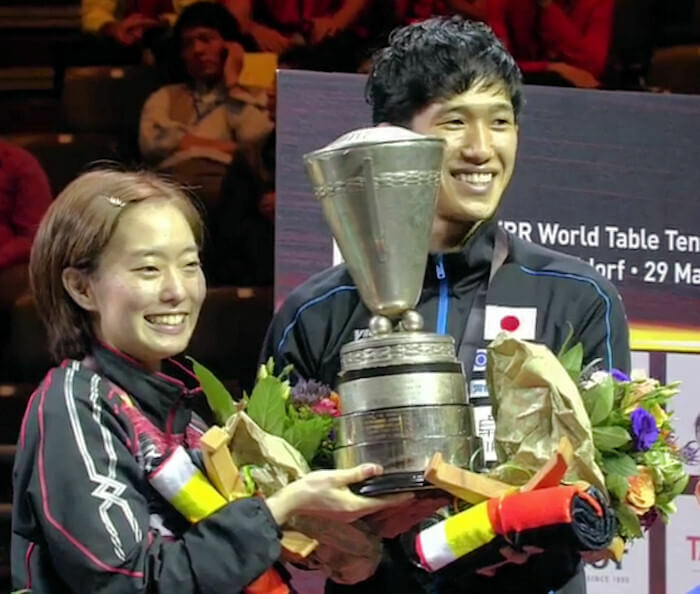 In the 2017 mixed doubles event, it was Kasumi Ishikawa and Maharu Yoshimura from Japan who took the title of World Champions when they beat Chen Chien-An and Cheng I-Ching from Chinese Taipei to win The Heydusek Cup. Kasumi Ishikawa and Maharu Yoshimura will hold the title until the next individual events take place in Budapest, Hungary from 21-28 April 2019. The 2018 World Team Table Tennis Championships took place in Halmstad, Sweden from 29 April to 6 May 2018. China were the clear favourites to retain their Men's Team title which they won in 2016 and they duly obliged, beating Germany 3-0 in the final to retain The Swaythling Cup. China will hold the men's team title until the next team events take place in Busan, South Korea in 2020. 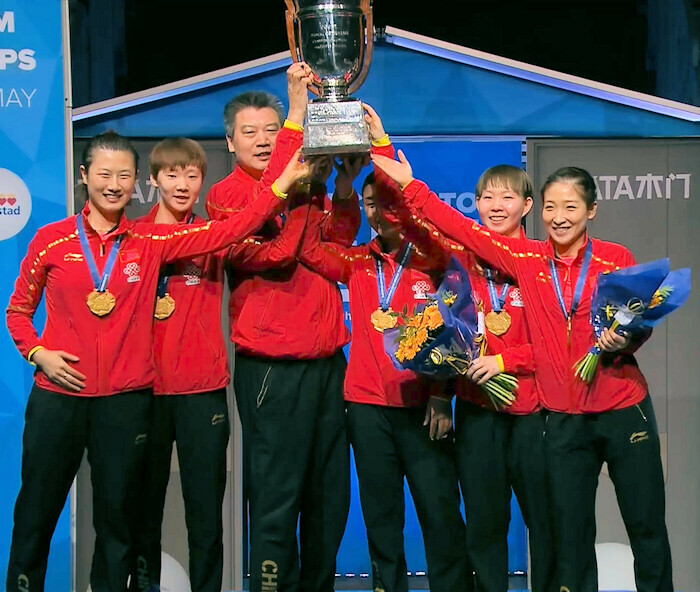 China were the clear favourites to retain their Women's Team title, and they duly obliged, beating Japan 3-1 in Halmstad, Sweden to win the Corbillon Cup in 2018. China will hold the women's team title until the next team events take place in Busan, South Korea in 2020. But how did the World Championships begin? However, the frequency and format of the world championship has changed through the years. Although the World Championship went from strength to strength - being held annually until 1939 - the second world war prevented it from being played in 1940 ... and for the following six years. However, by 1947 the time was right to recommence, and it once again became an annual event. The Hungarian and English players dominated the World Championship for the first 25 years and it wasn't until 1952 that the European stranglehold was finally broken. Japan's Hiroji Satoh astonished the world with his unexpected victory in the men's singles that year - in part due to the unique sponge-covered racket he used to bamboozle his opponents. 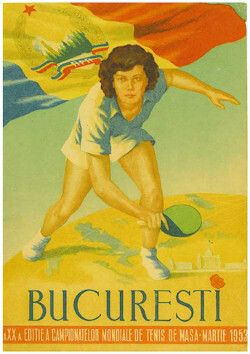 But it wasn't until 1953 in Bucharest, Romania that China first entered the World Championships as they became full members of the International Table Tennis Federation (ITTF). At the World Championship's Annual General Meeting in Tokyo, Japan in 1956, the ITTF voted in favour of changing it to a biennial event. By starting this change with effect from the 1957 event in Stockholm, Sweden, they also ensured that it wouldn't clash with the Olympic Games held in the even numbered years. 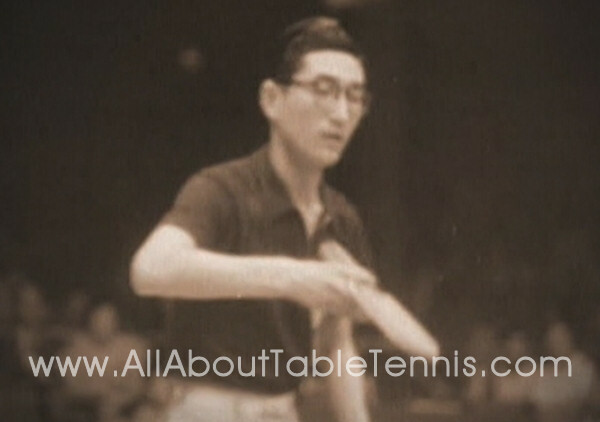 The 1959 World Table Tennis Championships were held in Dortmund, West Germany and that year also saw the first Chinese winner of the men's singles title as Jung Kuo-Tuan beat Hungarian Ferenc Sido in the final. From that point on, China and Japan started to dominate world table tennis, consistently taking the men's singles title. It was only Stellan Bengtsson (pictured right) of Sweden in 1971, and Istvan Jonyer of Hungary in 1975 who stopped the men's singles title from going to the Far East between 1959 and 1987. However, during the 1990s, the European players once again dominated the world game with Jan-Ove Waldner, Jorgen Persson and Jean-Philippe Gatien becoming World Champions in 1989, 1991 and 1993, and Jan-Ove Waldner winning his second title in 1997. 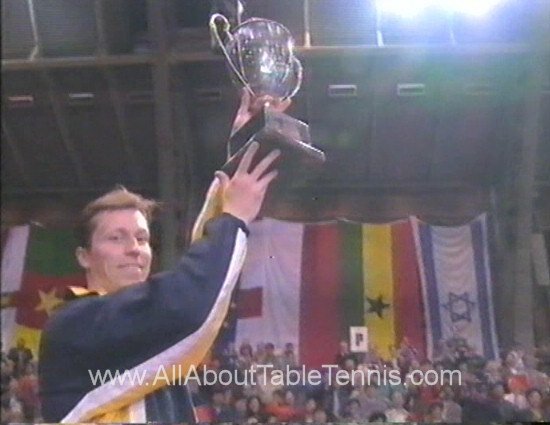 Starting in Kuala Lumpur in 2000, the World Table Tennis Championship was split into two separate competitions. The team events are now held in even numbered years, whilst the individual events (singles and doubles) are held in odd numbered years.